I've admitted it before, but I'm not the most adept person in the kitchen. Being a stickler for directions, I can often follow a recipe well enough for it to be edible... it's just that it is often fairly plain. So when it comes to being one of those moms that can whip up a batch of cupcakes or a pan of brownies, more often than not mine taste like they came straight from a box. Plus, on top of the lack of exciting flavor, it's not usually the people that I see every day that are the ones that I'd like to give a treat to. I'd like to surprise an out-of-state friend with something yummy to celebrate her new baby or it would be fun to send a birthday greeting to a family member that would be a real treat, right? Fortunately, that's where the internet can help me. When I want to send an award-winning, fresh and delicious indulgence, I know that I can just turn to David's Cookies and, with a few clicks, it's done. Top New York City chef, David Liederman, opened his first David's Cookies store in Manhattan back in 1979 and, over the years, delighted fans across the country with his delectable cookies. 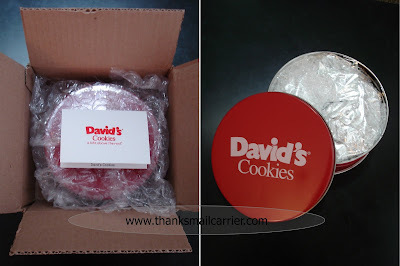 However, it was the joining of the digital world in the late 1990s that has made it possible for David's Cookies (which offers delicious desserts of all kinds) to be purchased and delivered right to your front door. And, no matter what kind of day you're having, when a package from David's Cookies arrives at your doorstep, things are immediately brighter. 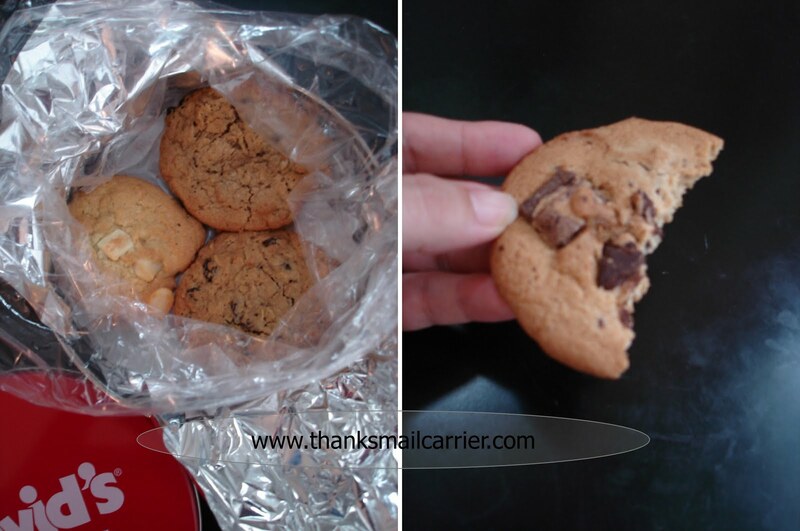 For me, opening the Fresh Baked Cookies 1 lb. Tin was a combination of anticipation and mouth-watering excitement - did I mention that I'm a big cookie fan? The iconic red David's Cookies tin was wrapped safely inside the box and its contents, one luscious pound of assorted cookies, were nestled inside multiple layers to keep them fresh and tasty. Deciding between the Chocolate Chunk, Peanut Butter, Macadamia and White Chips, Oatmeal Raisin, Cherry and Double Chocolate Chunk was the hardest part about enjoying these cookies. Each one was just the right mix of chewy and crispy and it was a good test of willpower whether or not these would last more than the first day. Plus, there were a few others around here that were extremely eager to give their opinion as well. 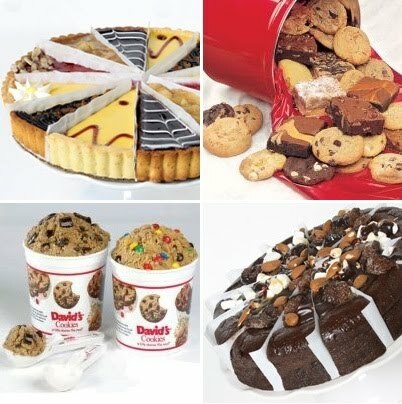 With a selection offering everything from cookie dough to brownies to cheesecake and available individually or a part of a "of the month" club (mmmmmmmm), David's Cookies has a tasty gift for you or your loved ones. As they offer a 100% satisfaction guarantee on all of their products, you can rest assured that your dessert will always arrive fresh and delicious. Check them out for your next occasion, event or holiday! Be sure to connect with David's Cookies on Facebook, Twitter and, of course, their tasty, tasty website. My weakness is anything with chocolate....brownies, cookies, etc. These look so good! 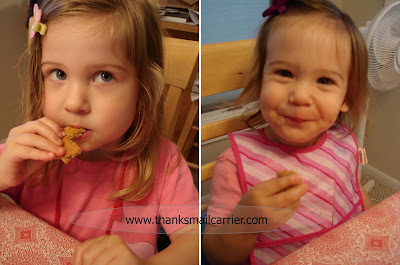 Yum....I love cooking but despice baking so this is just perfect...little sisters face is way too cute!